DETROIT—”It was an explosion of color! And the precision of the dancing was mind-blowing. 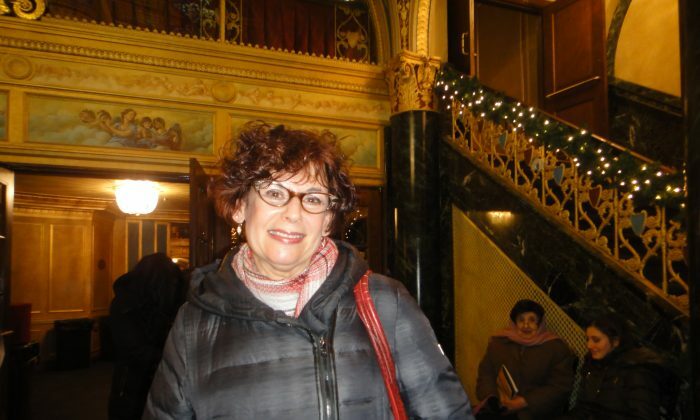 It was a feast for the eyes,” exclaimed Debra Luria, a former professional ballerina and figure skater, after catching Shen Yun Performing Arts’s last performance at the Detroit Opera House on Jan. 3. Seeing the New York-based Shen Yun artists on stage brought back memories of her own time under the limelight—the excitement and energy. “I remember all the work that went into each performance. I remember the excitement of going on stage. I remember the enjoyment of hearing the applause. I remember the freedom of movement,” she said in nostalgic reminiscence of the past. Within the Shen Yun performers, she saw the same love for their art, the same delight in performing and sharing the beauty of dance, in this case classical Chinese dance. “I can identify with them. Their enjoyment in what they’re doing just shone through,” she said, smiling. I think it’s a marvelous statement about the direction society is going in—should be going in. Her husband Mark Luria, a dentist, agreed. “It was wonderful! And the colors, the synchronicity! It was just a really beautiful, beautiful show.” He continued on to praise the exquisite hand movements, the live orchestra, and the striking dancing. “So unbelievably choreographed,” he said. He found it absurd that Shen Yun cannot travel to and perform in China. “That restriction, that they wouldn’t allow this kind of art to be shown to people there—it’s really unfortunate, really unfortunate,” he said. For many decades, the Chinese Communist Party has systematically attempted to suppress traditional Chinese culture, values, and beliefs through movements like the Cultural Revolution. Out of this destruction, a group of leading classical Chinese artists rose up and came together with the mission of reviving the authentic, divinely-inspired culture of China and bringing it to audiences worldwide. This was how Shen Yun was created back in 2006. The New York-based company has since captivated millions around the globe, bringing audiences on a journey through several millennia of Chinese history and cultural traditions with an uplifting, artistic performance of music and dance. Mrs. Luria greatly appreciated the performance for bringing back traditional Chinese culture and sharing it with everyone. “I think it’s a marvelous statement about the direction society is going in—should be going in,” she said.